Note from Beth: The long anticipated social network site for social change, Jumo, launched. Here’s the article from today’s New York Times. Many of us have been up early playing with Jumo, setting up our individual profiles and finding issues and organizations or setting up profiles for organizations. It is still clearly in beta, with the usual tech glitches and 500 errors, which will smooth out as more people play with it and give them feedback. As the platform matures, we’ll get a better sense of the power and potential of this network that lets people find, connect, and support social change organizations and issues. Amy Sample Ward shares her first reflections and critique of the platform and wonders what’s the point? The platform was seeded with some initial organization profiles and a focused set of issues. The organizations are a combination of smaller, progressive organizations like Ushahidi and the Sunlight Foundation and large venerable institutions like NPR and the Kennedy Center for the Performing Arts. Anyone can set up a profile for an organization (it prompts for an EIN number (but not required) and Facebook account url) and you can opt to be the administrator. Charities outside the US can set up a profile. To generate a robust profile, your organization should be able to plug in existing social media presences (Flickr, Twitter, YouTube, Blog RSS Feed, Etc) so it seems to favor organizations that have already established a social media content strategy. Jumo helps connects people with issues and organizations on the first rung of the ladder of engagement, but the challenge will be how to cultivate relationships to bring people up that ladder to higher levels of engagement and involvement – from following and connecting to making donations to making change offline. My colleague, Evone Heyning, calls this “more sticky interactions.” It will also be interesting to track how Jumo helps organizations and causes attract new supporters and what is required in terms of time commitment and strategy to be successful. My colleague, Steve MacLaughlin, who is on the East Coast and had a jump start this morning offers his first take on Jumo. If you have had a change to play with Jumo and have some insights, please share in the comments. Since the beginning, Hughes has said that Jumo is “an online platform to connect individuals and organizations working to change the world.” GuideStar does have Jumo International listed as a nonprofit organization but very little information is shown and likely won’t be until they file their first 990 with the IRS. Jumo has been raising $2 million in funding from individuals and foundations. About $500,000 came from unnamed individuals in the early days and in September 2010, Omidyar Network announced a grant of up to $750,000. By November 2010, Jumo noted in a New York Times article that they’ve raised $3.5 million. Chris Hughes brought in Kirsten Titus as Managing director of Jumo. She brings experience from working in and around the nonprofit sector. Hughes also enlisted Scott Thomas, former director of design with the Obama campaign and author of Designing Obama. He has also put together a team of advisers including Jeffrey David Sachs, Director of the Earth Institute at Columbia University, Jacqueline Novogratz, CEO of the Acumen Fund, and Linda Rottenberg is CEO and Co-founder of Endeavor. Jumo setup their offices in New York City’s SoHo neighborhood. They have also been very active on Facebook and Twitter along with a few entries on the Jumo blog. Not to mention a lot of press coverage in The Huffington Post, The Wall Street Journal, Fast Company, Mashable, The Chronicle of Philanthropy, and The New York Times. The Jumo website had its soft launch back on March 18, 2010. In the very early days of the website they had visitors answer a series of questions about interests, skills, and cause activities. Two of the questions were “Which of these places would you most like to visit? Argentina, France, India, or Kenya?” and “On Sunday, are you most likely to be: at brunch, at church, at a museum, or watching the big game?” It’s unclear what was done with the information captured and that area of the website has been inaccessible for some time now. 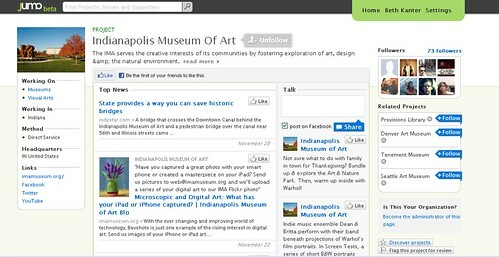 The beta launch of Jumo on November 30, 2010 will help users find causes to match their interests, likes and preferences. Users will be able to follow nonprofits to receive updates in their news feed and will be able to support those organizations in a variety of ways. Jumo users must have a Facebook account and are walked through three simple steps to register for the website: Create Your Account, Your Interests, and Create Your Profile. After giving Jumo some basic details and your interests the site lets you start picking projects that you are interested in. Jumo was seeded with more than 3,000 issues and groups, but anyone with a social mission can create a page. The site then uses your location to show organizations in your area. After completing these first few steps the screen then shows your very own social media dashboard with information about the organizations you are following. This is also where the connection to your Facebook account comes into play. Your friends on Facebook that have Jumo accounts also start to appear in the “Talk” sidebar of the website. What also becomes clear very quickly is that organizations that have embraced the use of social media get a lot more leverage on Jumo. National Wildlife Federation, for example, is very active on various social networking websites and they immediately appeared in several places on my Jumo page. Jumo is not the first initiative to use social media in the nonprofit sector and it won’t be the last. Will millions of people sign-up, actively participate, and help drive change? My guess would be as accurate as anyone else at this point. But this is an important step for the nonprofit sector and its move into the digital age. We are entering a new period where people from outside the nonprofit sector are going to try their hand at driving change. They bring with them new ideas, approaches, and tools to engaging with people. Their experience comes from a digital perspective and there is no such thing as “we’ve always done it this way.” Organizations trying to change the world can certainly benefit from changes in how they engage with supporters. What you think of Jumo’s potential? Steve MacLaughlin is the Director of Internet Solutions at Blackbaud and is a frequent blogger, presenter, and writer about technology trends in the nonprofit industry. This post is also published on Steve’s blog. Thank you Beth & Steve for the quick analysis. After playing w/beta Jumo, I feel like I did on Guidestar’s 1st day and when DonorsChoose came out. A tingly feeling that Jumo could be very useful, and a feeling of wanting more. I had an OMG moment when I found the DONATE button. Hopefully, Jumo will make it easy enough for a 6th grader to understand the value and impact of the social sector. I’d like this platform to demystify engagement & simplify the process of talking with and learning from nonprofits & their supporters. I want something bigger than Facebook. Thank you for the comprehensive blog post! Jumo seems like a great initiative (I wasn’t able to access the site yet), but I was hoping it would be more than taking the charity-search-websites to a Facebook/Twitter era. This makes me thing of Change.org. I don’t understand why so few of the articles about Jumo don’t start with: in the footsteps of Change.org, Jumo comes along with more money and a famous founder to reap a late mover advantage…. Thank you Beth and Steve for the great article! It will be interesting to see where Jumo goes in the next few months as well as the following years – I think they have the right people leading the way to create a great network providing a social need! This will be the challenge, and Hughes seems very adamant that this network will be more than just an online space where people can donate to a certain cause – I think this will be the true power of Jumo if Hughes is right – people making a connection online that grows to a real-time, personalized connection, relationship, and positive social change. Thanks to both of you for the analysis! I think Jumo has potential, but the rough launch and similarities to existing portals means it has some work to do before nonprofits will love it and use it frequently. I definitely agree with Beth’s comment that it’s a great vehicle for nonprofits who already have a social media strategy, but that does leave a lot of nonprofits out of the equation.